When the hubby is home alone, he often dines on his signature "Snack Dinner". While he's away this weekend on a baseball road trip, I decided to make my own version of a snack dinner to enjoy lounging on the couch in front of the TV. I will be enjoying this cheese for a while. It is a Bourree cheese, and according to their website, "Bourree is washed rind cheese with an earthy aroma, supple paste and a rich, creamy texture that melts into a beautiful smoky, meaty, lingering finish. Bourree is made from raw cow's milk, uncooled, from only a single milking." For my snack dinner, I paired it with a crusty baguette, a few slices of monterey jack (cheese fest, after all), sliced bosc pear, cherries, carrots, cucumber, and a homemade yogurt dip. I poured a glass of YB Wines Rose (my recent purchase from The Urban Grape). This is a neat wine - organic, packed in a tetra pack. It's not too sweet and not too dry. Easy drinking for a warm summer night and matched well with the simple flavors of my snack dinner. Next year we'll head to Vermont for the festival. For now, I'll keep cutting off wedges of cheese and thinking our trip next July. Anyone want to come over for a snack? I love snack dinners! Your pictures are really getting very good! Great post! Hi Lara! Missed you at the festival. 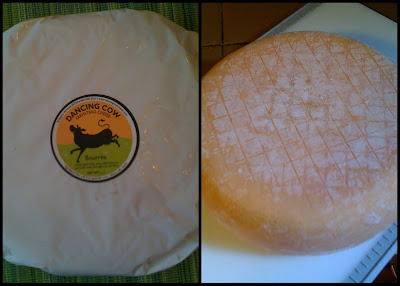 I stopped and talked to the Dancing Cow people at length and they are lovely - not surprised they gave you this gorgeous cheese. I bought a piece of Bourree to take home and it is delicious.